Remnants of a Norman abbey where Alfred the Great was buried have gone on display after the carved stones were unearthed in two private gardens. The archway components, from the former Hyde Abbey in Winchester, were found at an archaeological dig in April. The details were kept secret while historical research was carried out. 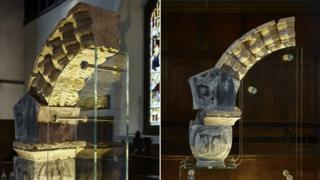 Some of the 11 "elaborate" large carvings and dozens of fragments have been pieced together for an exhibition at St Bartholomew's Church in Hyde. The Hyde900 group and 150 volunteers took part in a three-day "community dig" in two private gardens in King Alfred Terrace. Most of the archway components were found embedded in mortar, about 20cm (8ins) underground. Prof Martin Biddle, an expert on Winchester's archaeology, said the stones had been taken from the abbey ruins and used to build a medieval wall. He said the "elaborately carved" pieces were among "the finest examples of the mason's art" in the 12th Century, showing the abbey's "huge importance". Image caption Prof Biddle said the pieces were "elaborately carved"
Following King Alfred's death in AD899, his remains were moved to several different locations before being interred at the abbey in 1110. In 2013, a grave at St Bartholomew's was exhumed in the search for the king's body, but the remains were found to be from the wrong century. The archway components were displayed at the church over the weekend before being removed while a permanent home is sought. Hyde900 said it hoped the arch could be completed after further garden excavations in 2018.